Wella Professionals introduces its latest scientific innovation, new Wwllaplex with Opti pH System, an exclusive strengthening treatment that helps to reconstruct inner hair bonds for stronger hair guaranteeing the best lifting results on the market. 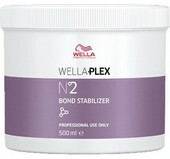 It’s designed to work in perfect synergy with Wella hair color and care. Wellaplex meaning that bold or subtle hair changes can now be made with the assurance that hair will be healthier, flexible and more manageable.